If you thought building websites wasn’t for you, think again. Sparkle is the intuitive site builder for your online portfolio, team or band pages, or business and client sites. Skip the tedium and design a gorgeous site that works right out of the box. 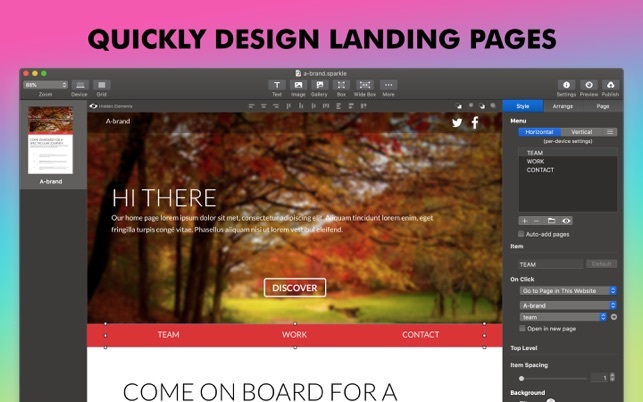 • Create landing pages in a matter of minutes. Test your ideas quickly. • Focus your attention on content and layout. • Quickly iterate on fully functional site designs. Sparkle turns your design into a live site on the fly, no coding and no jargon. You don’t need to know about code or other web programming concepts: Sparkle makes sites happen. 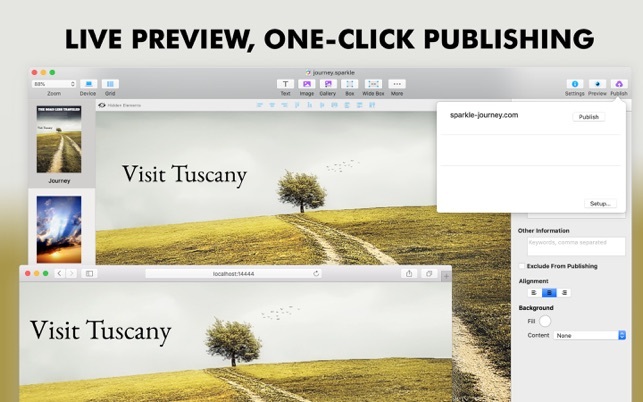 • Quickly add galleries, video, audio, maps, social buttons, and downloadable files. 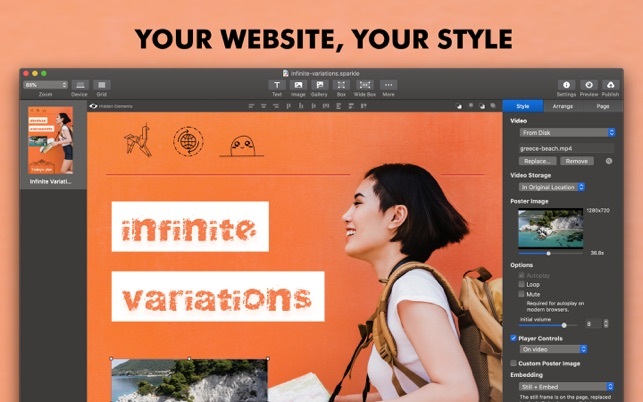 • Web fonts, retina graphics and delightful animations for stunning output quality. • Visual contact form creation. • Default wireframe look to share your site at any stage of construction. 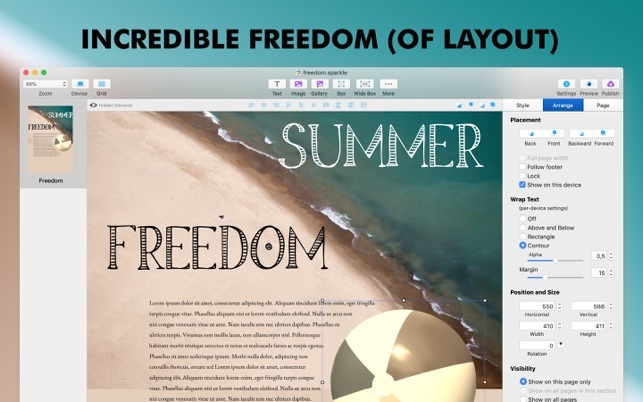 Sparkle’s freeform layout means you’re never constrained by a rigid page structure or by templates. • Mobile device support via phone and tablet specific layouts. • Live preview of your site on computers, tablets and phones, while you edit. • Built-in incremental FTP to rapidly publish to any web host. • Privacy and cookie law support. 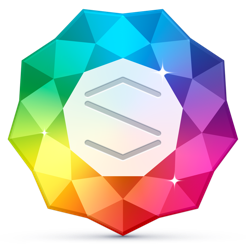 Sparkle features cutting edge code and asset generation, ensuring your site will be high performance and compatible across a broad spectrum of web browsers. • Familiar interface, fits right in on your Mac. • Great integration with other apps, all content at your fingertips. • Born on macOS, optimized for Mojave. • Backed by a product-focused company praised for its support and helpfulness. 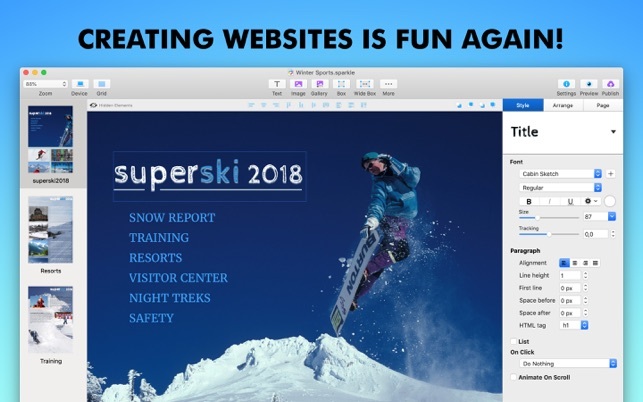 "We use Sparkle to create hundreds of quick landing pages to test our marketing strategies, Sparkle has saved us many hours of development time." David Tera, Director of Marketing, IDA - Int'l Design Awards. • added support for macOS Mojave and dark mode! I’ve been juggling a very demanding full time job, and a hobby that I love and get paid for, for 40 years. I am a professional salesman, and on the weekends, a professional children’s entertainer. I AM NOT A WEB DEVELOPER. I need tools that are powerful intuitive and easy to use. When I need help, I NEED HELP. I’ve been using Sparkle for a couple of years now, and every time I’ve needed help, their SUPPORT team has been WORLD CLASS. My day job is selling technology products to Fortune 500 companies—and Sparkle’s SUPPORT team is on a par with any of the SUPPORT teams that I’ve ever worked with, and I’m comparing them to teams that support mission critical multiple million dollar investments in infrastructure. In particular, Duncan Wilcox is amazing! He is responsive, tenacious, and competent. I don’t even want to say how far and above the call of duty he will go, because I don’t want to set the bar TOO high for him and Sparkle, but what he did for me today was very, very impressive. He’s an inspiration for how I want to treat my customers in all of my endeavors. The product itself is great. But if you’re going to run a business, small or large, and count on the product, YOU NEED GREAT SERVICE—and Sparkle delivers!!!! I have a simple website that I made years ago with iweb. When iWeb was discontinued, I switched to Freeway Express, which was discontinued a few years ago. I recently decided it was time to update my site with a new app. I really like to be able to start with a blank slate, rather than a template. I tried WordPress, but it only uses templates, and if you want to start with a blank slate, it adds a lot of complexity. 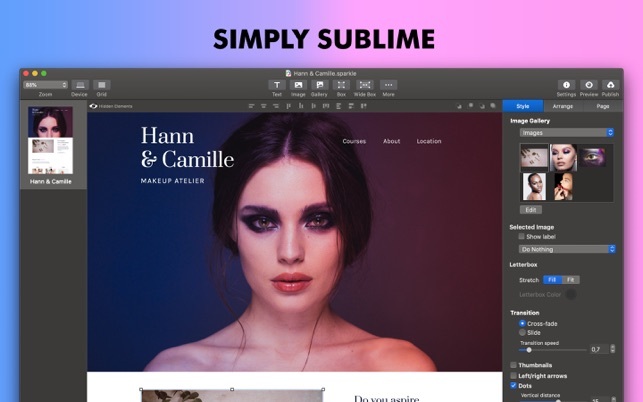 Almost all other web design apps make you use a template. Sparkle is a gem in that you can start with a blank slate. They also have templates if you want. They have a very nice feature where you can import an existing website into it. This essentially means you can use any website as a basic template if you want. Once I got used to it, I started to really enjoy the simplicity and creative process. I also emailed Duncan for some questions I couldn’t easily figure out, and he responded quickly. I’m so glad I found Sparkle! I'm cabable of editing basic HTML by hand. But that's not how I want to do it on the Mac. I want to drag and drop content where I want it and have the editor handle the precise HTML. Sparkle lets me do that. I also don't want to use a "template" where my website has to fit the way their professionals set it up. Sure that makes for a decent website. But I want to control the horizontal. I want to control the vertical. I want to put my image here, my text there, and so on. One other feature about Sparkle is the easy support of different website layouts based on the client screen width. Sparkle's manual reports this is necessary to get an optimal Google search score. Sparkle makes this easy. You layout your content in one screen size. All your content is automatically added to the other screen size. You just need to go to each screen size and move it around to the correct position.